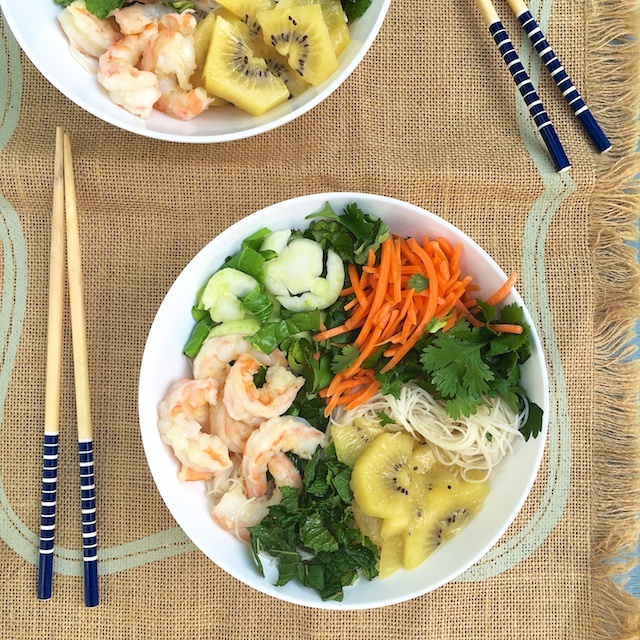 Perfect for hot weather, this gluten-free shrimp noodle salad has a surprising ingredient: SunGold Kiwifruit! So, this recipe started out as a tiramisu and ended up as a noodle salad. Go figure. 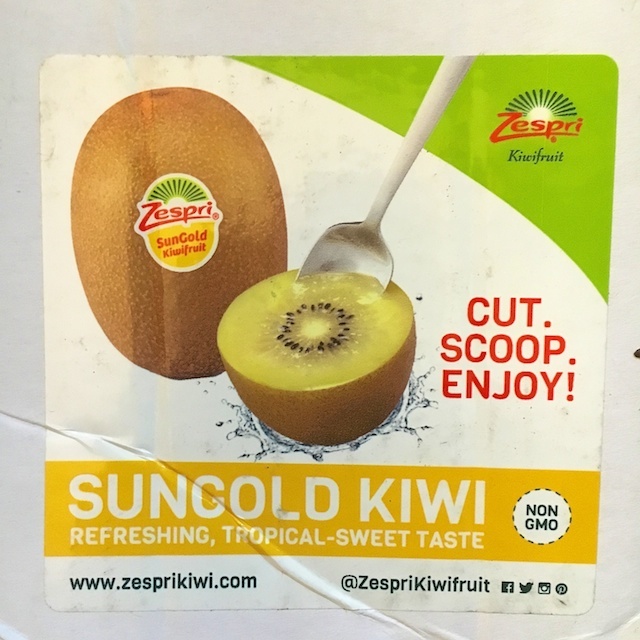 But that’s because my mind was seriously racing with ideas when we found out that Zespri Kiwifruit was sponsoring a recipe challenge for our Recipe ReDux members featuring their new varietal – SunGold Kiwifruit. All around I think kiwifruit is such a delicious yet underused fruit. You can use it an ingredient in so many ways you already use other fruits – everything from breakfasts to desserts. So, I did start with dessert (that tiramisu) but then I was craving tacos. I considered making kiwi shrimp tacos because I love fruit salsa with tacos (still going to try this at some point) but ultimately I landed on this Vietnamese salad because of the HEAT people. During these hot, hot months, I love the simplicity of Vietnamese cuisine and the cooling flavors of fresh mint, basil and cilantro. I ate this salad for two days straight during a heat wave. 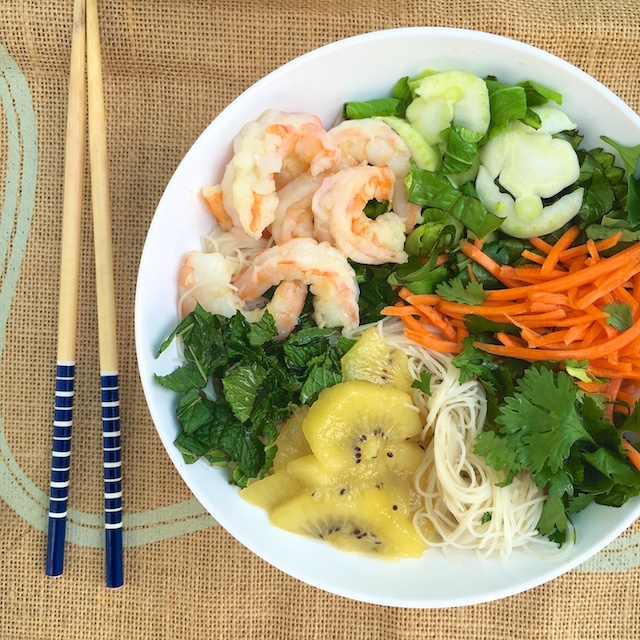 Perfect for hot weather, this gluten-free Shrimp Vietnamese Noodle Salad has a surprising ingredient: SunGold Kiwifruit! To make sauce, whisk together lime juice, fish sauce and brown sugar in a small saucepan. Whisk in water and bring to a boil. Lower to simmer and heat for a few minutes or until sugar has dissolved. Remove from stove. When ready to serve, divide cooked noodles and shrimp among four bowls. Carefully arrange bok choy, SunGold kiwifruit, carrots, mint, basil and cilantro among the bowls. Drizzle each bowl with 1/4 cup lime fish sauce. Serve with lime wedges. If mixing with dairy, add kiwifruit to the dish right before serving as that actinidin also breaks down dairy proteins and can lead to curdling. When adding to hot dishes, add right at the end as kiwifruit is delicate and breaks down easily. 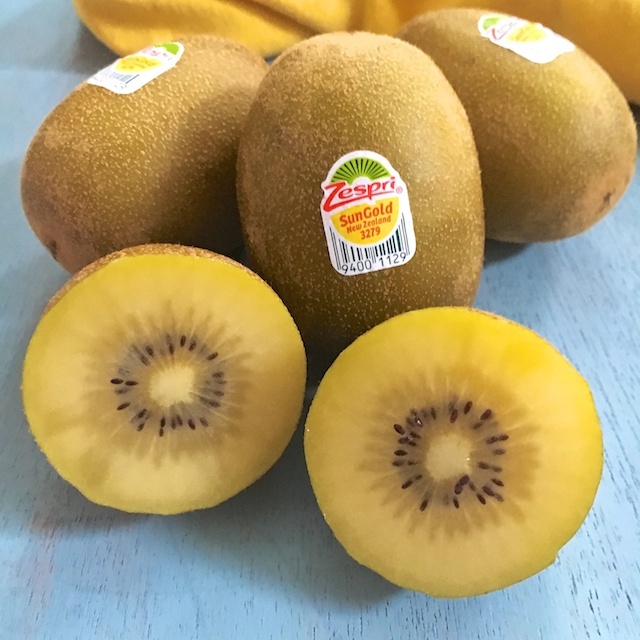 Have you seen these SunGold kiwis yet in your store? How do you like to eat kiwifruit? Check out all the creative recipes featuring SunGold kiwis below! This looks so delicious, I love the use of kiwi in this as well. What a great way to utilize that fruit in a different way! I love the evolution of this recipe Deanna! Of course it looks amazing too. Minus the shrimp-ha,ha! This reminds me of the yummiest Green Papaya Salad I had at a Vietnamese restaurant in Hawaii a few years ago. Love the addition of kiwi to this salad! I’m seriously loving those golden kiwis–this noodle salad looks awesome! I’m glad you made the salad, Deanna! It sounds and looks so bright and fresh! Me too, Cindy – thanks much! Exactly how I’ve been feeling over the past few weeks! 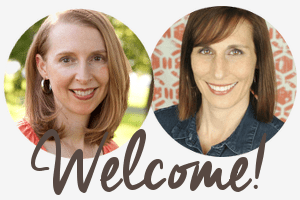 Haha my post is going live tomorrow, but I wrote the SAME thing…started out with one idea, went to tacos/salsa too, then ended up with something completely different. Love that the kiwis are so versatile! Haha – can’t wait to see what you ended up making!